Sophie and Anna Maddocks design, create and hand-make Wedding dresses, Bridesmaids dresses, Mother-Of The Bride outfits, Flower Girl dresses, Christening gowns, Communion dresses and Bridal accessories. Why not make an appointment to visit the Bridal Studio to discuss your ideas and let Sophie and Anna make the perfect wedding dress or special outfit for you. 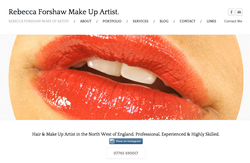 Professional Make Up Artist with national experience of Fashion Shoots and Shows, Beauty Images, TV and Film Make-up, Bridal Make Up, Special Occasions and One on One Make Up Lessons.